If you’ve visited the Philadelphia area or Drexel’s campus, you’ve probably noticed that some of our best casual meal options are served right out of a truck. That’s right, food trucks can be found all over our city (and especially on our campus) with culinary variety from your usual burger, to cultural delicacies and even dessert options like cupcakes, froyo and fresh fruit. Here at Drexel, we have lots of food trucks – there’s something for everyone. There are the “staples” that you can always find on our campus and “visitors” that come and go as they please. We took a stroll around campus during lunch time and stopped at some of our student’s favorite trucks. Cucina is a staple truck here on our campus, and serves amazing Asian fusion tacos, burritos and their famous homemade bubble teas. Open daily from 11am – 5pm located between Main Building and Bossone Research center, coined “Food Truck Alley”. Another regular truck on campus that always attracts a line is the Halal Food Cart. They’re conveniently located on the corner of 33rd and Market across from the library. Famous for their chicken over rice, Halal is open daily from 11am – 8pm. For carboholics everywhere, we bring you Schmear It, home of the build your own bagel. Fulfill your any time of day breakfast dreams with a fresh bagel smothered with customizable spreads and toppings. Schmear comes to campus every Thursday from 7:30am – 1:30pm, located on 34th & Market right outside the Thomas R. Kline School of Law. 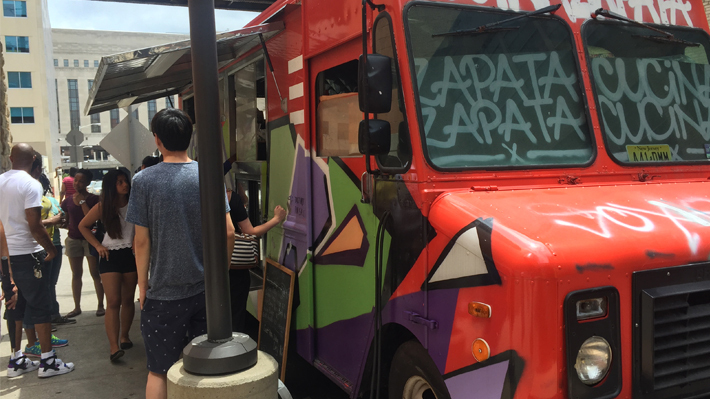 There are dozens of excellent food truck options all over campus and all over the city. Get your taste buds ready for these delicious adventures! VP of Strategy for Campbell Soup Company Emily Waldorf, is tired of people telling professionals – especially women - that the way to get ahead is to simply, “lean in.” Waldorf shared her tips to success at LeBow’s Lunch, Learn, and Lead event.